Korea in the past years has invested Herculean efforts to extend the international boom for its cultural exports, dubbed "hallyu" (the Korean wave). However, there are increasing arguments that the government should relax its aggressive marketing as foreigners seem to be showing signs of recoiling from the smell of nationalism. A survey of more than 3,600 people from Asian countries, Europe, the United States and Russia by the Korea Foundation for International Cultural Exchange (KOFICE) showed 66 percent of the respondents predicting hallyu will become irrelevant as a commercial force in their countries within the next four years. More than 15 percent of them believed hallyu has reached that point already. KOFICE, which conducted the poll in November last year and recently unveiled the results, observed that the popularity of Korean cultural products in Japan and China, which have been the centers of the hallyu boom, is dwindling rapidly. The success of hallyu is critical in the minds of policymakers, who are desperate to extend the country’s industrialization "myth" to culture when its manufacturers are struggling to keep up with their rivals in China and other developing nations, which can compete more ruthlessly on cost. However, too much bureaucratic talk about cultural ''exports’’ and not enough about cultural "exchanges," seem to have bred fatigue in hallyu-consuming countries. "We all know how popular hallyu is and these cultural products can have far-reaching impact and potentially complement Hollywood as international products. However, the government is too involved in this picture and even Korean culture exporters are seeing this as heavy-handed," said Han Seung-bum, president of the Korean Wave Research Institute (KWRI). "The government has been busy planning one-off events of every kind, but officials are only chasing immediate and tangible outcomes, and not looking at the long term picture. The government wants to be a player on the field when they are better equipped as cheerleaders. They should focus on creating an environment where these companies can exercise larger creative freedom, which means more institutional support and less restriction." Hallyu began to take root in the late 1990s when Korea began finding international markets for its films, television shows and music. Then the soap opera, “Winter Sonata,” aired on Japan’s NHK television in 2003, touched off a national fever, and launched hallyu as an international phenomenon. Korean cultural products have since found markets beyond Asia and garnered followings in the Middle East, Latin America and to a lesser extent North America and Europe. However, KOFICE believes there are reasons to think that hallyu has already passed its peak. In its survey, about 71 percent of Chinese respondents said they believe hallyu will be diffuse in their country within the next five years. About 24 percent of them said Korean cultural products no longer pass the coolness test. Among Japanese respondents, 91 percent of them gave five years for hallyu to matter. About 30 percent of the respondents said they were already fed up because Korean dramas and pop music have become predictable and cliched. The government has been consistently involved in efforts to expand the market for hallyu. 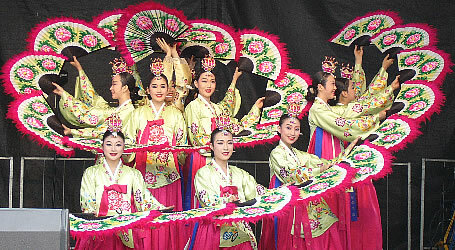 Korean Cultural Centers, located in practically every country Korea has diplomatic relations with, are required to organize cultural events and other activities to assists hallyu exports and promote Korean culture. Recently, the cultural center in in Washington organized a "hallyu camp," giving an opportunity for American students to visit Korea during their summer vacations and experience its culture first hand. However, there are debates on whether these excessive promotions are working as prescribed. "Look at the case of Psy. He is popular because global fans found something to enjoy in his music, not because the government made a decent argument that everybody should like him. The consumption of cultural products is voluntary," Han said.